Postscript: Cay Carpenter looked up the log book of his father, Tom, and sure enough, Tom was the camera operator on this sortie. The pilot was Gordon Bigg and the Anson was indeed VH-AVT. 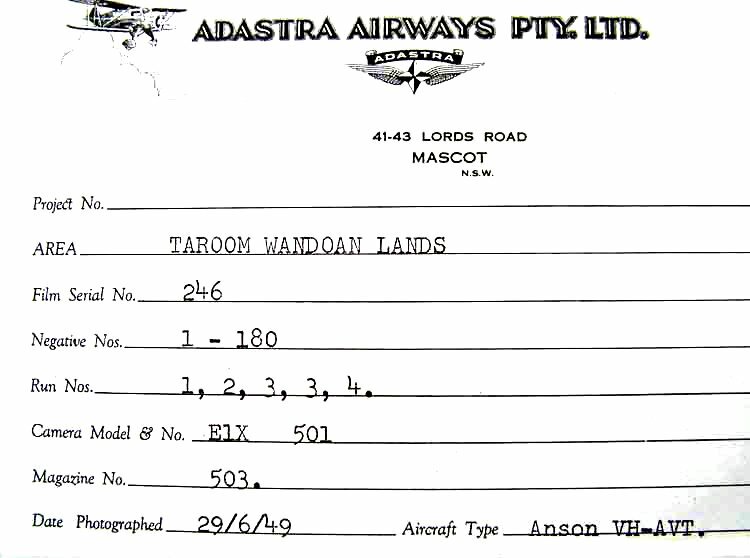 The aircraft had positioned from Mascot (Sydney) to Eagle Farm (Brisbane) on 27 June 1949 and from Brisbane to Dalby on 28 June. The survey of Wandoan on the 29th involved 4 hours 25 minutes flying. Wandoan was photographed again the following day.